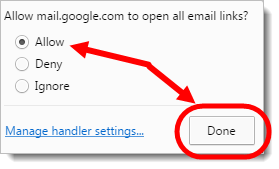 If you're using a Chromebook, you know that Gmail is automatically setup as the default email application. This means that when a teacher clicks on an email address within a web page (for example, a parent's email address within the Infinite Campus Gradebook) a blank email is automatically created. However, if you are using a Windows PC or a Mac, this is not always the case. When you click on an email address on a web page, a PC or a Mac may try to open up Outlook, Mail, or whatever other email application is installed. This can be a real pain! Fortunately, there is a fairly easy solution, but it only works if you are using Google Chrome. 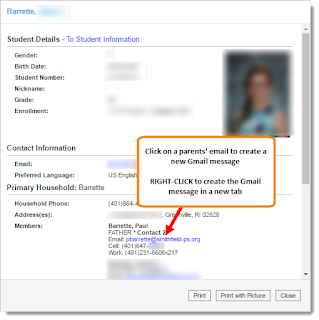 In the window that appears, click "Allow" and click "Done"
Now, when you click on a parents' email address in the Infinite Campus Gradebook (or any other web page), it should open a new Gmail message. You MAY prefer to open the new message in a new browser tab. 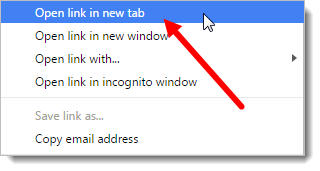 To do that, RIGHT-CLICK on the email address and choose "Open link in new tab"
This will make things so much easier! Great tip. Thanks.